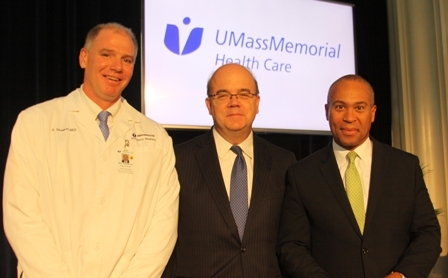 This week, I was honored to stand with Governor Deval Patrick and Congressman Jim McGovern to offer support of Question 4 on November’s ballot which would ensure access to earned sick time for hundreds of thousands of Massachusetts families. UMass Memorial Health Care sees Question 4 as a means to provide an obvious public health benefit by allowing employees to use earned paid time off when they are sick. Our organization holds sacred its solemn commitment to care for our patients, their families and our community and we view earned sick time as a crucial part of meeting our responsibility of keeping people well. As caregivers, we see firsthand the harmful effects of employees coming to work ill. We also know that many employees regularly face the extremely difficult choice between going to work sick and having to lose a day’s pay in order to stay home to care for a loved one or to see their own doctor to treat an illness or gain preventive care. Nearly 1,700 of our part-time and per diem employees across our system stand to benefit from the passage of Question 4. And while we know there will be a financial cost to our organization, we also feel that there is a cost and a risk to us all if we don’t support this effort. UMass Memorial views the earned sick time question in the same way Governor Patrick does – that we have an obligation to one another as citizens and neighbors of a state that provides the best health care in the world. As the prominent health care provider in our communities, UMass Memorial is proud to endorse Question 4. Thanks for taking great care of our patients and each other, and don’t forget to vote on November 4th. This entry was posted in Community, Employees, Patients and tagged earned time, Massachusetts voting, per diem employees, Question 4, sick time, umass memorial health care by Eric Dickson, MD, MHCM. Bookmark the permalink.